Electroencephalography is a test that measures brain electrical activity. 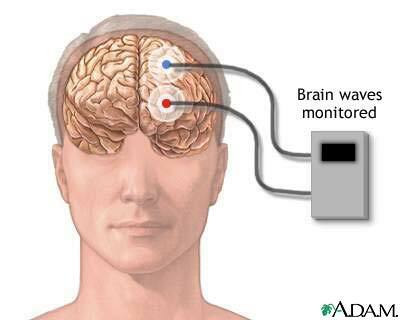 An electroencephalogram (EEG) is a test to detect abnormalities in the electrical activity of the brain. Brain cells communicate by producing tiny electrical impulses. In an EEG, electrodes are placed on the scalp over multiple areas of the brain to detect and record patterns of electrical activity and check for abnormalities. The test is performed by an EEG technician in a specially designed room that may be in your health care provider's office or at a hospital. You will be asked to lie on your back on a table or in a reclining chair. The technician will apply between 16 and 25 flat metal discs (electrodes) in different positions on your scalp. The discs are held in place with a sticky paste. The electrodes are connected by wires to an amplifier and a recording machine. The recording machine converts the electrical signals into a series of wavy lines that are drawn onto a moving piece of graph paper. You will need to lie still with your eyes closed because any movement can alter the results. You may be asked to do certain things during the recording, such as breathe deeply and rapidly for several minutes or look at a bright flickering light. You will need to wash your hair the night before the test. Do not use any oils, sprays, or conditioner on your hair before this test. Your health care provider may want you to discontinue some medications before the test. Do not change or stop medications without first consulting your health care provider. You should avoid all foods containing caffeine for 8 hours before the test. Sometimes it is necessary to sleep during the test, so you may be asked to reduce your sleep time the night before. This test causes no discomfort. Although having electrodes pasted onto your skin may feel strange, they only record activity and do not produce any sensation. EEG is used to help diagnose the presence and type of seizure disorders, to look for causes of confusion, and to evaluate head injuries, tumors, infections, degenerative diseases, and metabolic disturbances that affect the brain. It is also used to evaluate sleep disorders and to investigate periods of unconsciousness. The EEG may be done to confirm brain death in a comatose patient. EEG cannot be used to "read the mind", measure intelligence, or diagnose mental illness. Brain waves have normal frequency and amplitude, and other characteristics are typical. EEG may confirm brain death in someone who is in a coma. The procedure is very safe. If you have a seizure disorder, a seizure may be triggered by flashing lights or by hyperventilation. The health care provider performing the EEG is trained to take care of you if this happens.